How to understand soccer is rather simple once you learn the soccer laws of the game. The very basic understanding of soccer is that the game is won by the team that scores more goals at the end of 90 minutes. How to understand soccer will depend on who is trying to understand the game of soccer. From a player’s perspective, understanding the game of soccer takes years to master in order to be able to read the game situations quickly and more clearly before they even happen. Professional soccer players make it look easy when you watch them control the soccer ball and perform different soccer tricks and kicks on TV. These players have taken years to hone their skills and understand the game on a whole another level through constant practice, games and watching soccer on TV. Professional players understand the soccer game so well that they are able to read situations before they even occur. Many great athletes have said through interviews that the game slows down for them after playing and practicing a certain sport for years. Players will best learn how to understand the game of soccer through playing, practice and watching games on TV and live. Make sure when watching any soccer game to look at the big picture and follow what players are doing during both attacking and defending transition and both off and on the ball. Learning how to understand soccer from a fans perspective is as simple as learning the rules of soccer and following few soccer matches on TV or live. Soccer may seem boring to some people because it is a sport where not that many goals are scored, however soccer is also the most watched sport in the world as well as number 1 sport in almost every Country. Game of soccer is a lot of fun to watch because it’s a very fast paced, physical and nerve wrecking game for both players and fans. There are many moving parts on the soccer field that are divided into Defense, Midfield and Forwards. These players have to work collectively in order to have a better chance at winning the game. Watching or playing soccer as a young player, I used to watch only where the action was happening with the players in control of the soccer ball; as I got older I started noticing the big picture on the field with many different aspects of the game. In other words now I look at the whole picture whenever watching or playing soccer and notice that the games are usually won by the team that has all 11 players working and moving in sync. Soccer is a game where players who are not in possession of the ball need to do their part on the soccer field. This is a game where passing is the main skill used and the players will want to pass the ball around and build the attack slowly from defense into attack. This is a very physically demanding sport and requires players to be in top shape because of constant running without any breaks. The game lasts 90 minutes with a 15 minute break in between 45 min half’s. Each team starts the game with 10 outfield players and a goalkeeper, who is the only player that is able to use his/her hands inside the penalty box (16 m/yard box around the goal). If the goalkeeper leaves this area, he/she is considered just another outfield player. Soccer field is marked with lines that are considered out of bounds only if the whole circumference of the soccer ball crosses it. As long as any part of the ball is on the line, the play will continue. Players will learn how to understand soccer game better through games and practice with the right mindset and hard work to develop soccer fundamentals: passing, shooting and vision on the soccer field. Player’s mindset should be on always trying to look up and see every part of the field. 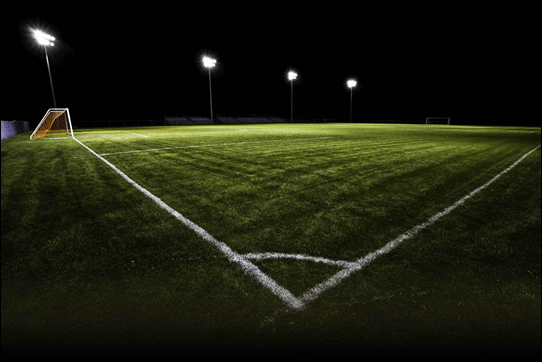 Players get caught up in watching the game or only focusing on their surroundings, when in reality the soccer field is 100 m long and 50 m wide on average, or bigger. The game is played with 10 outfield players and a goalkeeper on each team totaling 22 players at the start of the match. The game is regulated by 3 referees (or more as the time goes by). Center referee is the main referee who will control the game with the help of 2 more side referees on each sideline half of the field. Referee has the yellow card for cautioning the player and red card to eject the player from the game. If the player gets 2 yellow cards during any soccer match, it will follow with a red card and ejection from the game. Players are able to use any part of the body to control the soccer ball except the arms. Point is awarded when the team scores a goal by kicking the soccer ball over the goal line. Game is played in two 45min half’s with a 15min break in between. If the game is tied after 90 min and there has to be a winner, another two 15 min halfs will be played after which if the game is still tied players will take penalties to decide the winner. League games that end in a tie award each team with one point. I hope you understand the game of soccer a little better after reading my article. Keep playing and watching soccer to learn how to better understand soccer.